"Observations of past warming periods suggest that a number of amplifying mechanisms, which are poorly represented in climate models, increase long-term warming beyond climate model projections," said lead author, Prof Hubertus Fischer of the University of Bern. Will try to locate the original in Nature Geoscience later. Depending on how clouds react to global warming, they could cool or cook the planet. But, so far, we haven’t been able to predict which way they will swing. That’s a big problem for our ability to prepare for what’s coming. Understanding clouds, circulation and climate sensitivity is one of several grand challenges that the Swiss-based World Climate Research Programme (WCRP) is focusing on. The programme brings together scientists from all over the world to tackle big questions in climate science, and it considers cloud feedback “the intellectual and experimental challenge of our lifetime”. Clouds depend on a huge number of processes that act on scales from the sub-millimetre-sized world of water droplets and ice crystals to the kilometres-wide spread of a thunderstorm and beyond. Limits on computing power, however, mean that climate models are often ‘low res’. Their blocky simulations chop the planet up into 100 km square pixels. “So what we try to do is build mathematical models of how clouds work in one of those 100 by 100 kilometre areas,” says Jakob. These small-scale results are then averaged out and plugged into the larger-scale models. When it comes to warming, clouds acts in three ways. They act like silvery shields reflecting away incoming sunlight; they act like insulators trapping heat on the planet (recall how much cooler it gets on a cloudless night); and they act like radiators sending heat out into space. Whether a cloud acts more like a shield, a blanket or a radiator depends on where it lies and what it’s made of. And here things get diabolically complex. Though they are a small piece of the overall climate puzzle, solving the behaviour of clouds is a problem with many, many moving parts. “It’s completely unimaginable and actually one of the vital intense warmth occasions I’ve ever seen for therefore far north,” Nick Humphrey, a meteorologist who normally covers ocean storms, wrote on his weblog earlier this week (h/t Capital Climate Gang). Labe cautioned that not less than the GFS, one generally used mannequin, tends to considerably overestimate warmth, so full-on seaside climate won’t materialize on the Arctic Ocean. However whether or not temperatures are unusually excessive or off-the-charts excessive, the mix of warmth and wildfire smoke poses a definite threat for sea ice. We’ve already seen heat oceans and air gobble up ice method sooner than regular on either side of the Arctic, from the Bering Sea within the west to the seas round Greenland within the east. But it is bloody hot in Siberia near the Arctic Ocean, enough heat to melt quite a bit of ice in the Arctic! Lots of huge fires quite near the Arctic Ocean too! Over the past 3.5 million years, there have been several intervals when climate conditions were warmer than during the pre-industrial Holocene. Although past intervals of warming were forced differently than future anthropogenic change, such periods can provide insights into potential future climate impacts and ecosystem feedbacks, especially over centennial-to-millennial timescales that are often not covered by climate model simulations. Our observation-based synthesis of the understanding of past intervals with temperatures within the range of projected future warming suggests that there is a low risk of runaway greenhouse gas feedbacks for global warming of no more than 2 °C. However, substantial regional environmental impacts can occur. A global average warming of 1–2 °C with strong polar amplification has, in the past, been accompanied by significant shifts in climate zones and the spatial distribution of land and ocean ecosystems. Sustained warming at this level has also led to substantial reductions of the Greenland and Antarctic ice sheets, with sea-level increases of at least several metres on millennial timescales. Comparison of palaeo observations with climate model results suggests that, due to the lack of certain feedback processes, model-based climate projections may underestimate long-term warming in response to future radiative forcing by as much as a factor of two, and thus may also underestimate centennial-to-millennial-scale sea-level rise. Emissions of CO2 and methane from wetlands and melting permafrost as the climate warms could cut the “carbon budget” for the Paris Agreement temperature limits by around five years, a new study says. The findings suggest that human-caused emissions will be need to be cut by an additional 20% in order to meet the Paris Agreement’s 1.5C or 2C limits, the researchers estimate. We have less time than we think! Positive feedback is a bloody killer! Year remaining warm—and a new El Nino is forming in the Pacific! 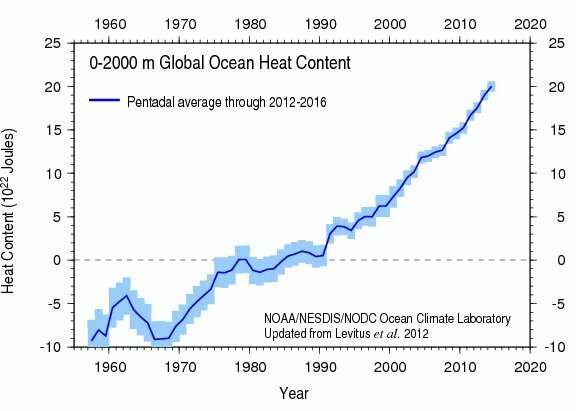 Global OHC is rising by ~10²³ joules / decade. 10²³ ÷ 5.1×10¹⁴m² ÷ 3.15×10⁸ seconds = 0.62W/m². We use a newly developed technique that is based on the information flow concept to investigate the causal structure between the global radiative forcing and the annual global mean surface temperature anomalies (GMTA) since 1850. Our study unambiguously shows one-way causality between the total Greenhouse Gases and GMTA. Specifically, it is confirmed that the former, especially CO2, are the main causal drivers of the recent warming. A significant but smaller information flow comes from aerosol direct and indirect forcing, and on short time periods, volcanic forcings. In contrast the causality contribution from natural forcings (solar irradiance and volcanic forcing) to the long term trend is not significant. The spatial explicit analysis reveals that the anthropogenic forcing fingerprint is significantly regionally varying in both hemispheres. On paleoclimate time scales, however, the cause-effect direction is reversed: temperature changes cause subsequent CO2/CH4 changes. It is not just by Mann I will say before deniers start their nonsense and no efforts to debunk it have made any headway—and fossil fuel interests have tried to debunk it! You can see the Little Ice Age (LIA) did not greatly reduce temperatures, it cooled by about 0.5°C compared to temperatures before and after. If an LIA happened now it would bring temperatures back to those of the 1980s. Remember that the LIA was not a real ice age—there were no ice sheets. Agung in the 60s was significant: lol!!! While it is getting colder there is also generally more moisture in the atmosphere as the globe heats up. But it doesn’t precipitate equally.